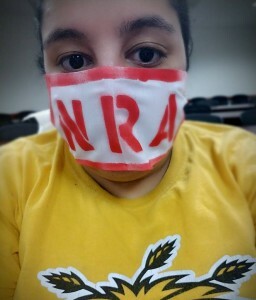 On May 17th, students from the Fail Campus Carry group attended to protest the monthly Kansas Board of Regents meeting by wearing cloths with NRA spray painted on them over their mouths. They were redirected from the meeting room to a side room, where they could only listen to live-stream audio. During this meeting, they were discussing the upcoming campus carry law and how KU weapon’s policy is different than the rest – it requires people with guns that are in backpacks or coats to have those items on them. They ruled to have KU change in accordance with the rest. During the break, one KBOR member came in the room to listen to the student’s concerns, but ultimately said there was nothing KBOR can do. After the meeting, the students all stood outside with the cloths as KBOR members exited the conference room in defiance against Campus Carry.